Set in early Victorian London, this is the story of a likable young man named Dodger, a “tosher,” or finder of treasure in the sewers, and how he becomes an unwitting hero. 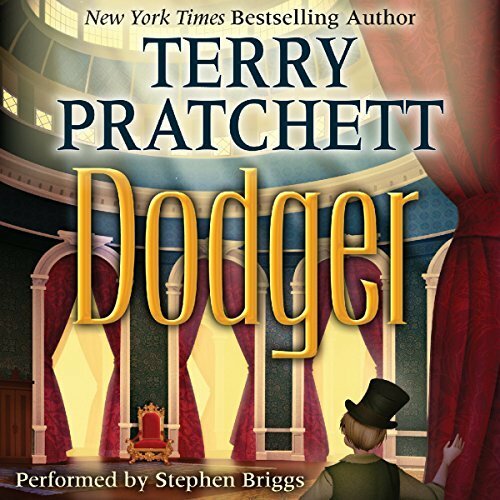 Dodger meets lots of fun and interesting people, including famous personalities like Charles Dickens, Benjamin Disraeli, and even Her Royal Highness, eventually. However, my favorite characters are those of his much-traveled Jewish landlord and his smelly dog. Stephen Briggs does an outstanding job with the voices, and his West Country accents are a hoot. There’s plenty of humor throughout and I giggled out loud a bunch. 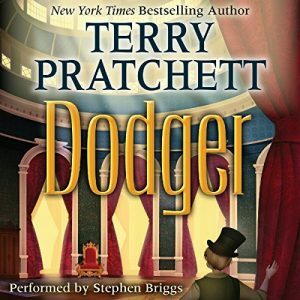 Yes, there’s quite a bit of silliness around, but consider the source… Terry Pratchett has quite an imagination (understatement of the century). Overall, a very enjoyable diversion.